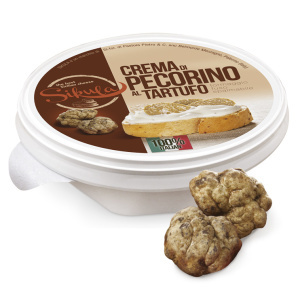 SI.FOR Pecorino Cream withTruffle is prepared exclusively with our cheeses made only from sheep’s milk 100% Sicilian. It ‘a great alternative to natural Pecorino cream. Enriched with truffle Bianchetto Borchi typical of Sicily, which in recent years has been widely spread, as appreciated by more and more people. Our cream is ideal to give a special touch to your dishes, a chance to put on the table fine dining with a simple gesture and a little ‘fantasy.